Rational Quality Manager (RQM) is a collaborative, web-based tool that offers comprehensive test planning, test construction, and test artifact management functions throughout the software development lifecycle. It supports managing and running tests created with Rational or third-party test tools, like Rational Performance Tester, Rational Functional Tester, Rational Integration Tester and so on. Rational Integration Tester (RIT) is used to create and run tests for a variety of purposes using a broad range of tools for tasks such as synchronizing with WSDLs and validating messages and data. It’s also used to create and run virtualization server, for example message-based stubs and database stubs. It can be used to create and run performance testing. This article explains how to integrate RQM and RIT, how to let the RIT Agent run as an RQM adapter, and how you can execute RIT tests and suites (this is only for test cases) in RQM’s centralized test management environment. RQM is deployed and ready to test. RIT Agent is deployed and ready to test. RIT is deployed and ready to test. Notes: RIT is used to create test cases here, if you have created test cases, it’s not necessary to deploy it. This step introduces how to configure the RIT agent as a RQM adapter to enable remote test execution. 1. The configuration can be modified in Agent.config, found in the config directory of the RIT Agent installation (C:Program FilesIBMRIT-Agentconfig, by default). The configuration file is an xml file that contains an empty or default configuration that can be changed to match the RIT and RQM installation environment. Note: By default, the RQM adapter functionality is disabled and must be configured before it can be used. username → The ID of an RQM user to be used by the agent/adapter when you are connecting. This user ID requires a Connector Client Access License, which are assigned within RQM, to allow access. password → The password for the user ID entered in Username. url → The base URL of the RQM server (for example, https://server.domain.com:9443/qm). rqmProject → The RQM project to which the configured agent connects. ghtProjectBaseLocation → The base location of your RIT projects (that is, the directory that contains the RIT projects that are used for running tests). For example, C:RationalIntegrationTesterProjects. rqmAdapterId → A unique identified for the current instance of the agent/adapter. Each running instance must supply a unique identifier. The host name of RIT agent server is a good choice. rqmPollInterval(Optional) → The polling interval in seconds. This interval is the wait interval between queries of the RQM server. Default value is 5.
rqmAdapterName(Optional)→ The name that is used when you are registering with the RQM server. 3. Restart the RIT agent service with services.msc. After configured the RIT agent and restarted it, the RIT adapter should be connected to RQM server automatically. Go to the URL “https://server.domain.com:9443/qm/web”, and click “Execution > Adapter Console”, you will get all connected adapters status. You have two ways to create the RIT test scripts. One is to export the test cases from RIT directly. The other is to add the test scripts and cases from RQM manually. You can create a reference to a RIT script in the same way that you create any other scripts in RQM. Go to the URL “https://server.domain.com:9443/qm/web”. Click Construction > Create > Test Script. Select the script type as Rational Integration Tester. Project: The name of the RIT project that contains the test to be executed. The project must be on the machine that is running the adapter. Test Path: The project path that specifies the RIT test to execute, for example, addNumbers/addition/additionCheck. Environment: The RIT environment that is used to execute the test. After you create the script, assign it to a test cases, and optionally, assign the test cases to a test suite. Configuring an RQM integration in RIT. One or more RQM servers can be configured in RIT. Once configured, a server can be selected as the target when you are exporting tests or tests suites from the Test Factory. Follow the steps to configure a RQM server in RIT. If not already running, launch RIT and select a new or existing project. Select Project Settings from the Project menu. The Project Settings dialog is displayed. Select the Quality Management tab. In the Quality Management Integrations pane, click Add. 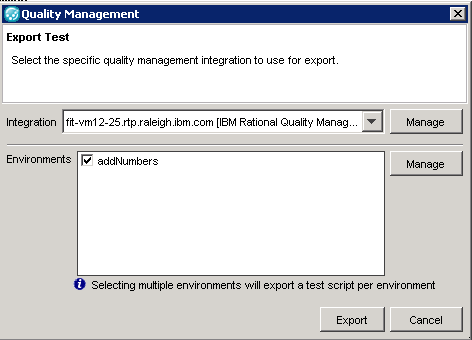 In the Select Provider dialog, click IBM Rational Quality Manager. A new Rational Quality Manager configuration is created. Name → A user-defined name that describes the integration – available integrations are listed by name when you are exporting tests and test suites. test suites, this name is the RQM project where they are created. username → Enter the user ID of an RQM user who has sufficient privileges in the named project to create tests and test scripts. password → Enter the password for the user ID entered in Username. This step is not necessary if you are using the RQM version 4.0.1 or later. It provides the files that are required by the server to enable the export of RIT tests into RQM. Launch RIT and open the project that contains the tests or test suites you want to export. Open the Test Factory perspective (F10). Right-click the wanted test or test suite and select Export from the menu. 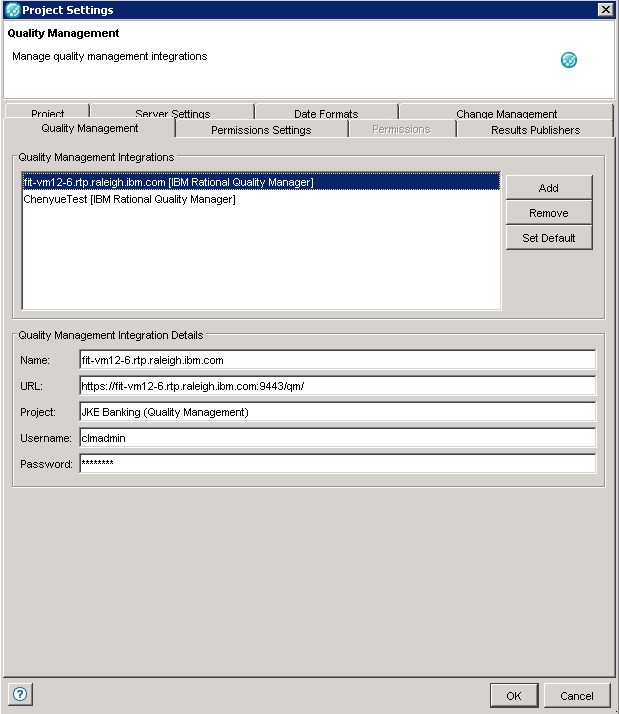 The Quality Management dialog is displayed. The default RQM integration is selected under Integration. If more than one integration are configured in RIT, select the wanted integration from the Integration field. 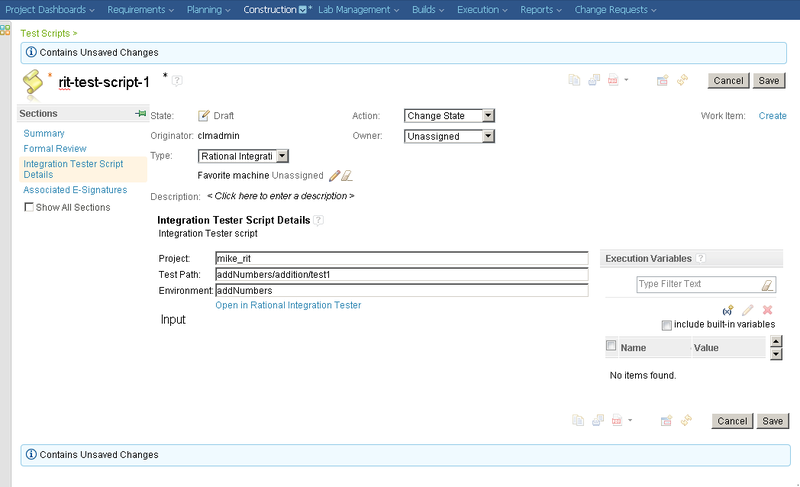 To manage the integrations in the RIT Project Settings dialog, click Manage next to the field. 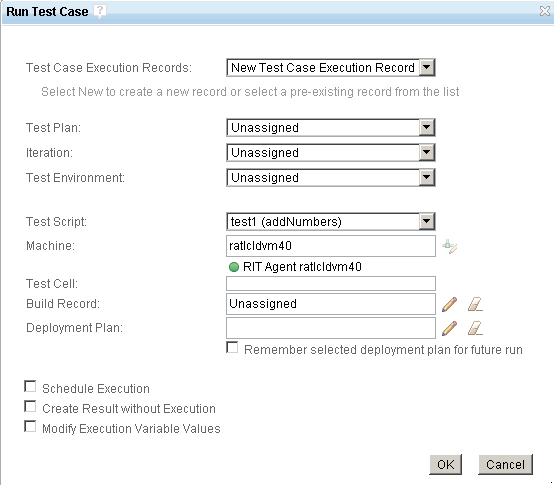 In the Environments pane, place a check mark next to the environments to use for the selected test or test suite. By default, the current environment of the asset is selected. To manage environments in RIT, click Manage next to the pane. When the integration and environment options are correct, click Export. 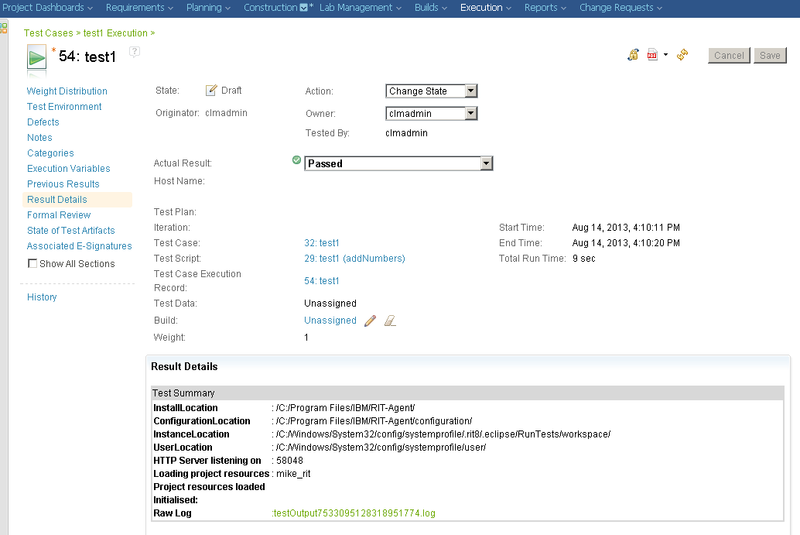 Once finished, select Browse Test Cases or Browse Test Scripts from the Construction module in the RQM console. 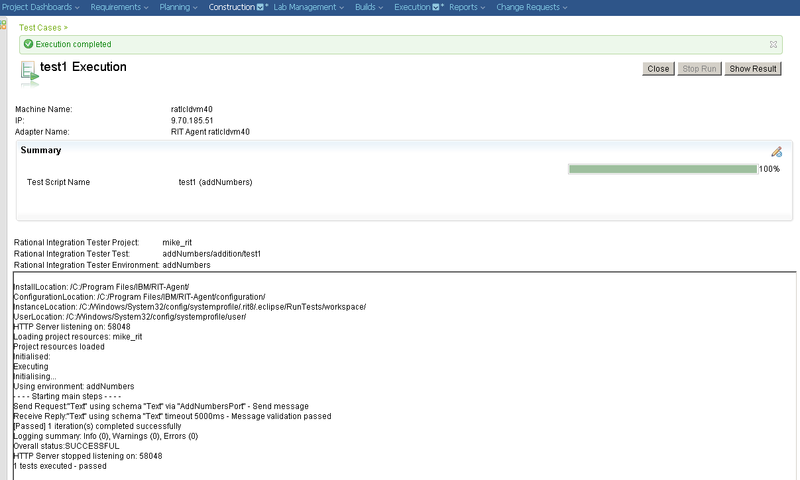 In the RQM console, click Browse Test Cases on the Construction module. All available RQM test cases are displayed, including the cases exported from RIT. Click the Run Test Case > Run, the Run Test Case dialog is displayed. If wanted, you can change the Test Script or Machine, then click OK, a new test case execution record will be generated, then the test case will be executed and the progress is displayed in the console. Finally you can view the detailed results of the execution, click Show Result. The results are opened in a new tab in the RQM console, showing the detailed execution results (the same as for any RQM test case). Ling Wang is a Software Engineer in the System Verification Test Team of IBM Rational Software Group. He is responsible for Server Rename testing and Legacy Integration testing for the Rational solution for Collaborative Lifecycle Management. He can be contacted at wlingbj@cn.ibm.com.